Stock-taking is one of those awful jobs that robots are primed to take. A Toronto-based company is working hard to make that happen, with a Segway-based robot that rolls down the aisles, scanning as it moves. The “Space Genius” looks like a marginally less threatening Dalek, as it rolls down the aisles of a store, using 3D cameras to scan aisles and record stock. 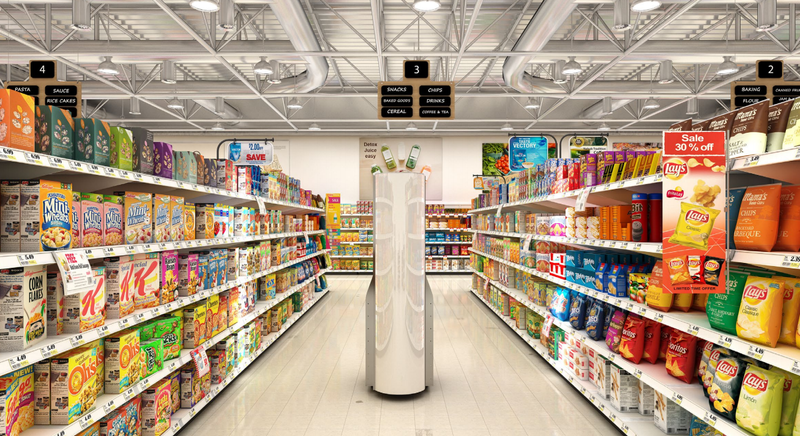 According to the manufacturer, it can inventory a normal supermarket in under an hour, apparently including the precise inventory (although previous attempts at store robots have struggled with that). The data allows the robot to not only replace humans, but go one better. The precise inventory it creates can make a to-the-product accurate virtual layout of the store. Shoppers can then use to find items in-store, and map out a potential shopping path, so that you have to spend the minimum possible time inside Walmart. What’s scary about this—from the perspective of a current store worker—is the speed at which it can be deployed. Previous attempts at making shops smarter have generally included adding RFID tags to every shelf, or installing a complex map of sensors. This robot promises a more simple solution, that requires very little infrastructure to be assembled before it can start replacing humans. Sure, you can’t ask this robot a question, but the entire idea is that you won’t have to—a smartphone app can instead tell you if something’s in stock, and then guide you step-by-step to the right shelf.